Lani arrived in the United States after a 7,200-mile flight Dubai early Friday morning and was quarantined at Arlington Park until 8 a.m. Sunday. The 3-year-old colt boarded a Creech Horse Transportation van shortly thereafter and travelled 330 miles south to Louisville. 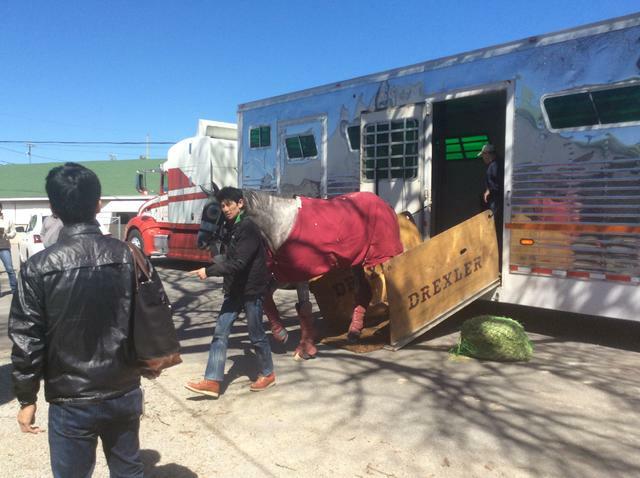 Lani was accompanied on the trip by assistant trainer Eishu Maruuchi and veterinarian Takanao Cho. Owned by Mr. Koji Maeda and trained by Mikio Matsunaga, Lani earned his way into Kentucky Derby 142 with a three-quarter-length victory under legendary Japanese jockey Yutaka Take in the $2 million UAE Derby (GII) at Meydan Racecourse on March 26. Lani travelled 4,800 miles from Japan to Dubai on March 15. Overall, the gray or roan Kentucky-bred son of leading sire Tapit boasts a record of 6-3-0-1—$1,366,618. Tanaka said that Lani would train Monday at 6:45 a.m. and that Matsunaga was expected to arrive in Louisville “for a few days” on Monday afternoon. Lani would be only the second Japan-based horse to compete in the Kentucky Derby. The first was Ski Captain, who finished 14th in 1995 under Take – the jockey’s lone Derby mount. Lani also would become the ninth Kentucky Derby starter that raced exclusively outside North America prior to competing in the “Run for the Roses.” None finished in the Top 5: Dr Devious-IRE (seventh in 1992), Thyer (13th in 1992), Citadeed (ninth in 1995), Ski Captain (14th in 1995), China Visit (sixth in 2000), Curule (seventh in 2000), Castle Gandolfo (12th in 2002) and Mubtaahij-IRE (eighth in 2015). Horses that raced outside North America have a record of 43-2-1-0 since 1967. The two winners were Venezuela’s Canonero II (1971) and Puerto Rico’s Bold Forbes (1976). England’s Bold Arrangement-GB is the only other foreigner to hit the board when he was second to Ferdinand in 1986. Lani is the fifth Kentucky Derby hopeful on the grounds at Churchill Downs. The others are Louisiana Derby winner Gun Runner (Barn 38 with trainer Steve Asmussen), Louisiana Derby runner-up Tom’s Ready (Barn 48 with trainer Dallas Stewart), Louisiana Derby fourth Mo Tom (Barn 29 with trainer Tom Amoss) and Louisiana Derby fifth Forevamo (Barn 45 with trainer Al Stall Jr.).